By General Editor: Ronald F. Youngblood, is a marvelously exhaustive dictionary for the home reader. Filled with a wealth of images, enough even for the picture hog that I am, there is plenty of diagrams, maps and genealogy charts. The information is perfect for the home scholar like a standard home school student or general home reader. I compared this dictionary to my mother’s The New Bible Dictionary. While this book doesn’t have as much in depth information as the TNBD, it is perfect for anyone that wants the basics. The information is easy to find and the cross referencing is easy to figure out. 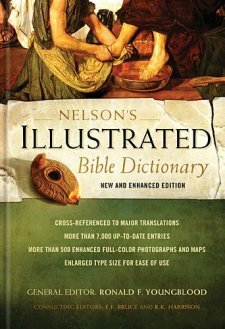 There is actually more information in areas like animals and foods of the Bible that I have not seen in other dictionaries. Which makes the information more user friendly. The hardcover book has a nice glossy cover that would easily wipe clean. The book is hefty, weighing in at just over five pounds, but it’s worth it with thick pages and plenty of fun stuff. There is even information that is crucial with references to other gods from Egyptian, Greek and ancient gods from Canaan. I love this dictionary. I am a sucker for dictionaries in general and I am always curious about things within the pages of the Good Book. Maps are wonderful and the images of ancient architecture are wonderful. I love seeing what the gates of Babylon look like now. Ephesus is one of my particular favorites. Anything Greek or Roman, and this book is filled with it. Along with a wealth of people mentioned that are not always in other dictionaries. I love how one entry references another entry and three hours later I might put the book down! I love that the book is so sturdy. I hate flimsy pages and I love glossy pages. The weight can be a little daunting when sitting in bed, but the information makes up for that. I know I will be using this book for years to come. I say this book is perfect for any age, but especially for Christian home schooler homes just because it is filled with so much information and it will be useful in those categories. I also think it is perfect for any Christian home use. I can usually say most non-fiction books get a five star rating and this is no exception. This book is a five star book and I highly recommend this book to anyone who wants a nice Bible Dictionary.